Classic Verdicchio Italian white wine with striking citrus fruits, and the attractive nutty flavours that make this grape famous. 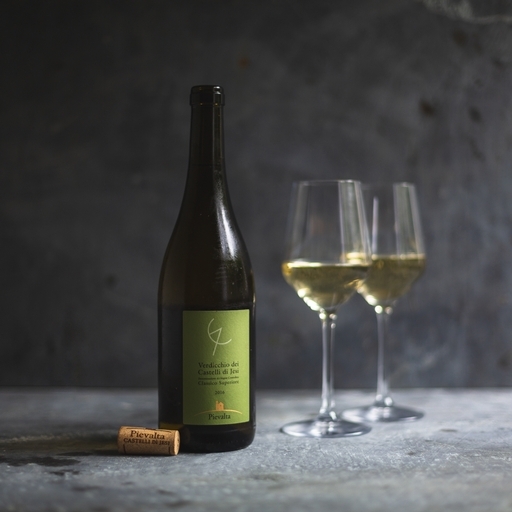 Fresh and zesty, it has a mouthwatering peach and almond palate, and a snap of green apple. Good paired with fish and shellfish dishes, it also makes an excellent aperitif. Get 5% off when you buy a case of six here. Keep lying down in a cool, dry, dark place. Barone Pizzini is one of the oldest and best-known wineries in the tiny Franciacorta region of Northern Italy, near Milano. In early 2000, Barone Pizzini extended its work beyond Franciacorta’s borders into some of Italy’s finest wine districts. Pievalta is a Barone Pizzini estate in the Marche, making wines that express the harmony and unique character of these areas through Verdicchio grapes, thanks to the use of natural, sustainable methods including organic and biodynamic farming.